like its quite possible to image with a CCD from the core of a city, in the absence of the moon. NGC884 and NGC869 both lie at a distance of 7500 light years. NGC 869 has a mass of 3700 solar masses and NGC 884 weighs in at 2800 solar masses; however, later research has shown both clusters are surrounded with a very extensive halo of stars, with a total mass for the complex of at least 20,000 solar masses. 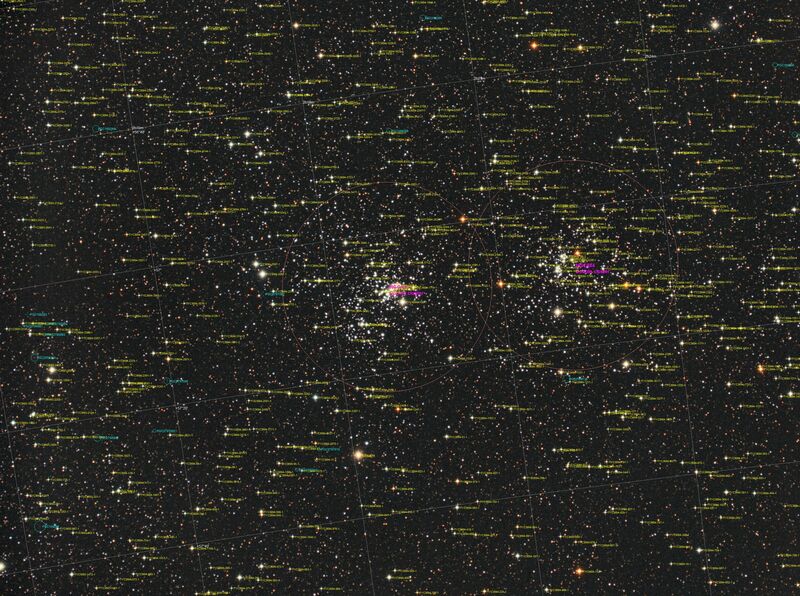 Based on their individual stars, the clusters are relatively young, both 12.8 million years old. In comparison, the Pleiades have an estimated age ranging from 75 million years to 150 million years. There are more than 300 blue-white super-giant stars in each of the clusters. The clusters are also blueshifted, with NGC 869 approaching Earth at a speed of 39 km/s (24 mi/s) and NGC 884 approaching at a similar speed of 38 km/s (24 mi/s). Their hottest main sequence stars are of spectral type B0. Perseus is the mythological symbol of adventure. Perseus was born the son of Zeus (The "Father of Gods and men") and the mortal Danae. He was a demigod but not immortal. Perseus was challenged by King Polydectes of Seriphos to slay one of the Gorgons (Medusa), whose gaze turned an on-looking victim into stone. Athena, Hermes, and other gods gave Perseus a helmet, a shield, and a curved sword with studded jewels on its handle to aid him in the challenge. Along with beheading Medusa, Perseus performed other heroic deeds as well, such as saving Andromeda who was a princess chained to a rock as a sacrifice to a sea monster. Due to his great accomplishments, the gods placed Perseus among the stars, with the head of Medusa in one hand and the jeweled sword in the other. The Double Cluster represents the jeweled handle of Perseus’s sword. Hipparchus, a Greek astronomer, cataloged the object (a patch of light in Perseus) as early as 130 B.C. However, the true nature of the Double Cluster wasn’t discovered until the invention of the telescope many centuries later. In the early 19th century William Herschel was the first to recognize the object as two separate clusters. 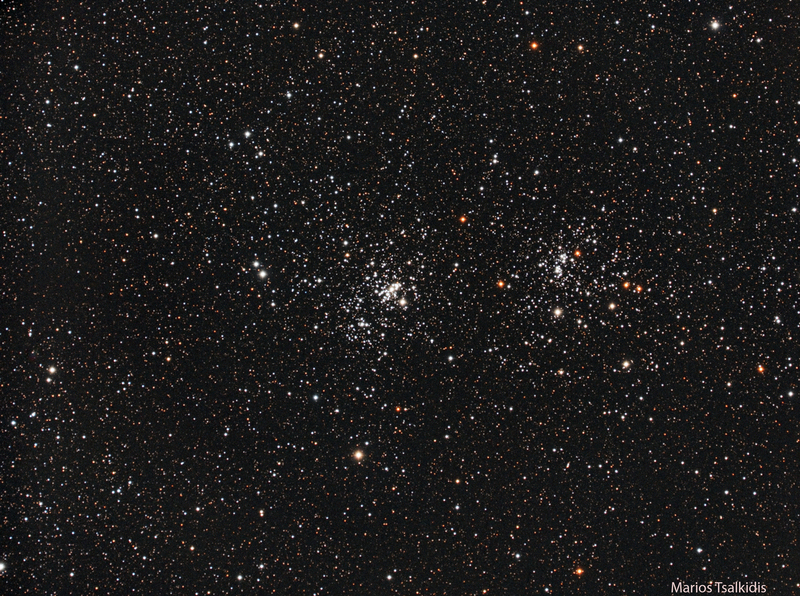 The Double Cluster is not included in Messier's catalog, but is included in the Caldwell catalogue of popular deep-sky objects not in Messier. Field of view ..... 1d 54' 36.0" x 1d 25' 18.6"